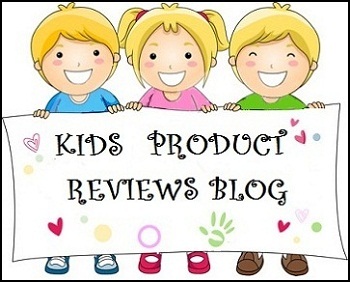 This is a review of Organic Surge Color Protect Conditioner. I had switched to this brand around a year ago, when I was searching for an SLS-free shampoo for my color treated hair. At that time, all Organic Surge products were available at medplusbeauty.com at a promotional discount of 50% and later the prices were raised to only 20% discount. Still medplusbeauty.com gives the highest discount on this brand. UPDATE Aug 27, 2013: This Color protect range has been discontinued and the new color protect shampoo and conditioner from Organic Surge will be restocked online soon. 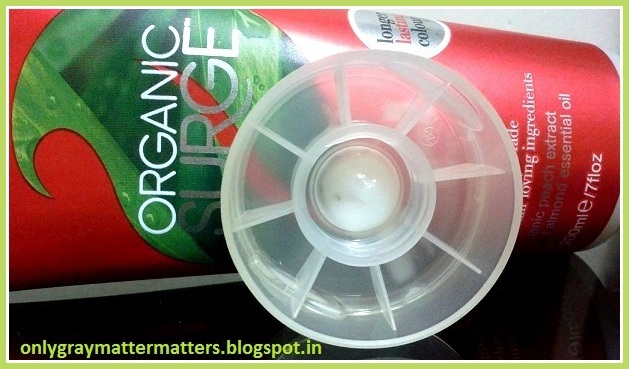 Organic Surge has reformulated its Moisture Boost range into a color protect range, but it is no longer sulphates free, though it may still be mild. 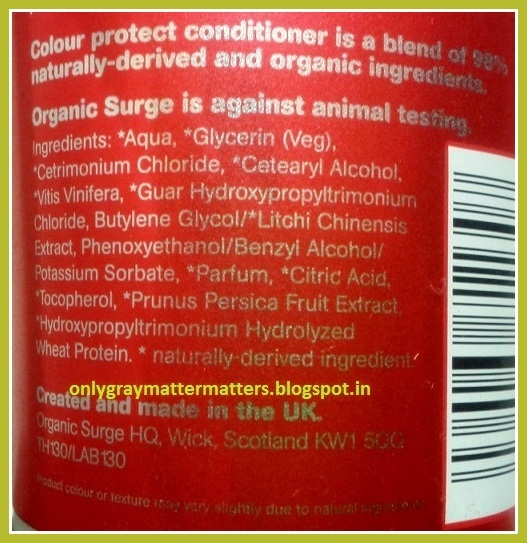 I had used two Organic Surge Color Protect Shampoo bottles and even though I wanted to try out this conditioner, I never felt the need. The shampoo itself turned out to be quite good and kept my hair very well. 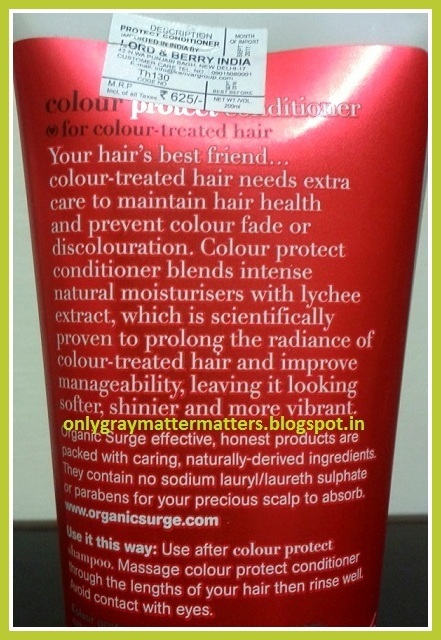 While ordering my third shampoo bottle, I happened to accidentally order this Organic Surge Color Protect Conditioner. 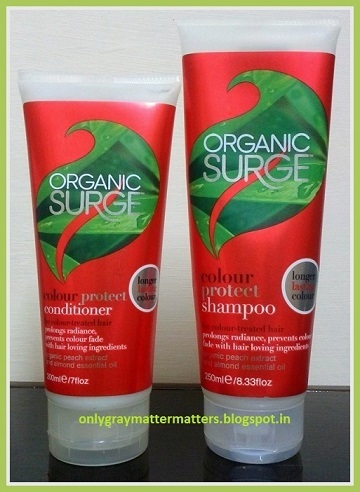 Organic Surge Color Protect Shampoo and conditioner bottles come in the same packing. The shampoo bottle is taller (250 ml). Contains organic peach extract and almond essential oil. Phenoxyethanol is used in products as an alternative to parabens and alone, it is unsafe for use near eyes, mouth, ear etc. But every product in the market contains either Parabens on Phenoxyethanol. Here, Phenoxyethanol / Benzyl Acohol / Potassium Sorbate combination gives it antimicrobial properties against Bacteria, Yeast and Moulds. These are added as preservatives. I have never felt any itching on the scalp or irritation with this conditioner. It is a white colored thick liquid, but needs to be dispensed carefully as a lot may drip out if you just hold the tube upside down. While the cap opens two ways, as a screw as well as a flip-top, it is almost impossible to put back the product once it comes out. One thing I have learnt over time is to always start with a new product with a very small quantity and add more as per requirement. For first use, I took out a very small amount of this conditioner and diluted it. It spread like magic on my very long hair and I did not need more conditioner. I keep it for 1-2 minutes and rinse. It rinses out very easily as compared to normal conditioners. But I do see some hair strands coming out just like other conditioners, though, not many. It is still a mystery to me why we see hair fall on using hair conditioners when we don't even apply it on our scalp, or are these already broken hair strands stuck in the hair length? Anyways, if I use this conditioner once a week, it dries out my hair ends like SLS based products and sometimes tangles them too. If I use it once in 3 weeks, it does condition and soften my hair. With that frequency and very little quantity each time, I have been able to use only a very small amount since March. I won't be able to finish up this conditioner soon. Till now I was regretting buying it but I recently tried it on my fresh Henna treated hair and it gave gorgeous results. Moreover, this time I diluted a little more quantity, which could also be the reason for better hair coverage. You can read the review of the shampoo HERE. I really wish this brand slashes the price in India and offers smaller bottle for the conditioner so people don't have to shell out so much money just to test out a product. For regular use, I still can't use it frequently as it is a little drying for my hair ends. If ever this conditioner starts giving me better results in the future for regular use, just like the shampoo did after the 'adaptation/adjustment' period, I will update this review. i am yet to find the perfect conditioner.. nd yes the mystery of hair fall is what deters me use any conditioner on a regular basis.. i start and then discontinue after a few usages and then go back to using my serums!! 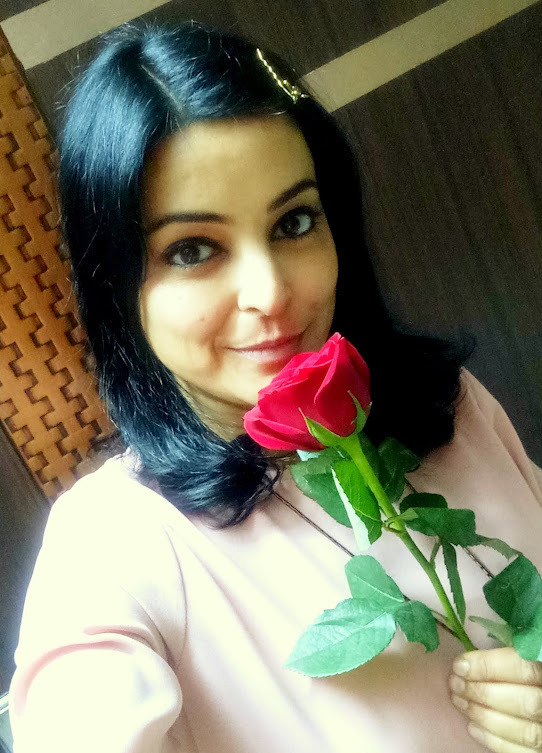 Dear Supriya, I had once read you mentioning about this conditioner in your Sunsilk Straight Shampoo experience and in another post you had mentioned you use Henna. So it is good that you use an SLS free shampoo for your Henna'd hair. Actually I tried this conditioner after my Henna session the day before and am surprised that it made my hair silky soft. So I now see some hope towards using it in the future after Henna. Ever since I have stopped using conditioners regularly, hair condition has actually improved. Try out the Argan Oil from Soulflower as a serum. Thanks for reading Jasmine. I know you don't color your hair but try out other shampoos from this brand. They are awesome. Try the Jungle conditioner by Lush. They last a really long time and is the perfect conditioner to use with almost any shampoo! Thanks for telling me about Lush. I didn't know they made conditioners too :) I will check it out. Thanks Tej, it is a great brand for people allergic to Sulphates or looking for a milder hair care brand.